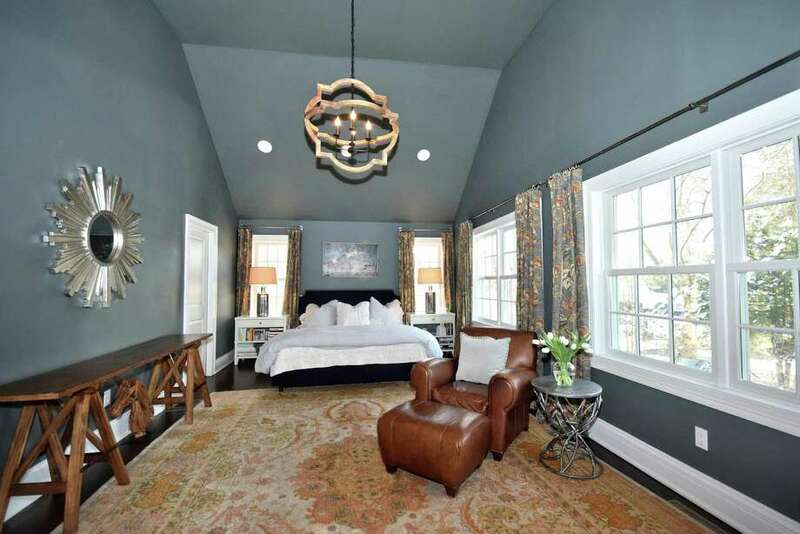 A wonderful first-floor master suite features cathedral ceilings with recessed lighting. NEW CANAAN — The beautifully expanded and renovated Cape tucked at the end of the private cul-de-sac Olmstead Court offers more than 2,600 square feet of turnkey living just steps from Main Street. With classic cedar shake siding trimmed with black shutters, the five-bedroom home was renovated not just inside, but on the exterior by its current owners, adding a new roof and gutters, French doors and new trim. A new custom native stone wall lines the driveway and extensive landscaping including new plantings, perennial gardens and the 10-foot arborvitae privacy wall lining the rear of the property added plenty of curb appeal to the already charming Cape. In a 750-square-foot 2014 addition, the owners expanded the kitchen, created a new great room and dining room and on the second floor, added two guest bedrooms with cathedral ceilings. With dark walnut stained wood floors, recessed lighting and French doors leading to a private backyard, the first-floor living space is decidedly comfortable without skimping on style. An easy, open floor plan creates seamless flow between a large great room and the modern updated kitchen and dining room. The renovated kitchen features classic white cabinetry with granite counters and subway tiled backsplash and a center island with butcher block counters and large utility drawers for storing pots and pans. Stainless appliances include a new GE dual fuel with convection stove, a built-in GE Monogram Advantium microwave doubling as a convection oven and a GE Monogram refrigerator. A separate living room features a wood-burning fireplace and built-in bookcases for displaying photographs and collections flank a cozy window seat. A first-floor master suite features cathedral ceilings with recessed lighting, an expansive walk-in closet with custom organizational storage and a spa-like master bath with a dual Carrara marble vanity, a sunken tub with a Carrara marble surround and an oversized frameless glass shower. On the second floor there are four guest bedrooms, one of which current owners use as a home office space. Two of the larger guest rooms feature vaulted ceilings with industrial-inspired pendant lights. A fully renovated guest bathroom features a soaking tub with a polished nickel hand shower, a frameless glass shower lined with subway tile and a dual marble vanity. A lower level offers a great playroom space and more than 300 square feet of extra storage space beneath the 2014 kitchen addition.